Looking for a unique side dish for your next barbecue? Kiwi Magazine presents this great idea, and as we discovered last night, it’s quite delicious; and no animals were harmed in the making of it. In fact, no animal products were used whatsoever. 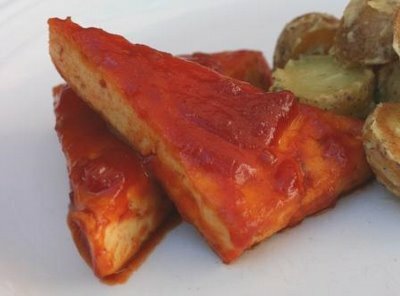 It’s extremely simple – grilled tofu and homemade barbecue sauce. The sauce is not very thick, but it’s full of flavor which the tofu absorbs nicely; next time, however, we will add some spiciness to the sauce. Grilling tofu gets it nice and firm on the outside while leaving the inside smooth, creating a dish that’s a nice twist on traditional BBQ sides. Enjoy! Combine the tomato sauce, onion, peanut butter, soy sauce, paprika, molasses, vinegar and sugar in a blender or food processor. Blend until well mixed. Pour into a saucepan, cover and bring to a boil. Reduce heat to low, uncover, and simmer for 15 to 20 minutes. Pat the tofu dry with a paper towel. Slice in half horizontally, then slice each half diagonally to form 8 triangles. Heat grill on medium. Gently toss tofu with oil and salt. Grill tofu about 7 minutes per side until golden brown. Transfer from grill to a platter. Drizzle sauce over tofu and serve remaining sauce in a small bowl. Eat!